Nitrogen gas is usually used as hot gas in a closed-cycle SD. Therefore, flammable organic solvents can be used for drying. Usually, APIs which are poorly water soluble are dissolved in organic solvents and spray dried. This system is called the closed-cycle system because nitrogen gas is circulated within the unit. This system facilitates easy production of a solid dispersion, which can enhance the solubility and bioavailability of poorly water soluble APIs. With a large number of poorly soluble compounds being developed recently as new drug candidates, the use of closed-cycle SD to improve solubility has drawn attention. Fuji Chemical defines these value-added APIs as functional APIs and offers various solutions to customers’ problems. 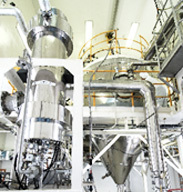 We can perform cGMP production from a small amount of compound and scale-up this process to suit commercial needs. Fuji Chemical has developed SDs of different sizes for the testing of a small amount of compounds prior to scaling up to the commercial production.